Welcome to 586 Alston Drive, a better than new, stunning home in the exclusive Black Creek Mountain golf community. Custom built, this home blends quality construction with exquisite design details. The phenomenal kitchen features quartz countertops, custom ceiling height cabinetry, roll-out drawers, a double-option oven, gas cooktop, an enormous pantry, and a stylish butler's pantry. Entertaining will be a breeze with the open floor plan, dining space, and outdoor living space that features a spacious deck, wood-burning fireplace, and scenic views. Tucked away on the main level is the master bedroom with a spa-like bathroom and an unbelievable closet. Upstairs are three additional sizable bedrooms, a full bath with a double vanity, a loft area, and a media room that could also serve as a fifth bedroom. Storage abounds in this home. Even the garage has an alcove that is perfect for your golf cart. 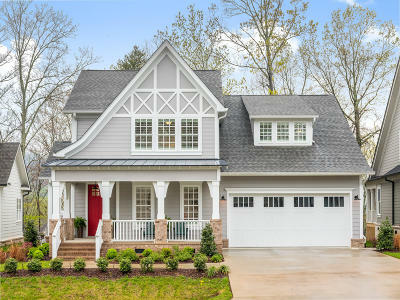 Less than a ten minute drive to Chattanooga, Black Creek Mountain is a stunning community with mountain views, an optional golf and social membership that includes luxury dining, three pools, tennis courts, ponds, hiking trails, and a soccer field. Schedule your showing today.